7 Tips on How to Choose the Right Picture Frame for your Painting | The Frame Gallery. For framing, art, sculpture & gifts. The perfect frame makes a painting complete. Want to know how to choose the right picture frame for your painting? We have pulled together 7 tips to help you get started. Before you get your picture framed, you need to think about where it will hang and if travel is required. Framing a picture can present it better, but it can also protect it too. If your painting is going to hang on your wall, depending on its size, you may want to choose a light frame. On the other hand, if your painting is going to travel, you’ll want to think about choosing a tough frame that will offer protection. Take some time to research the history of your painting and look at how it has been framed in the past. 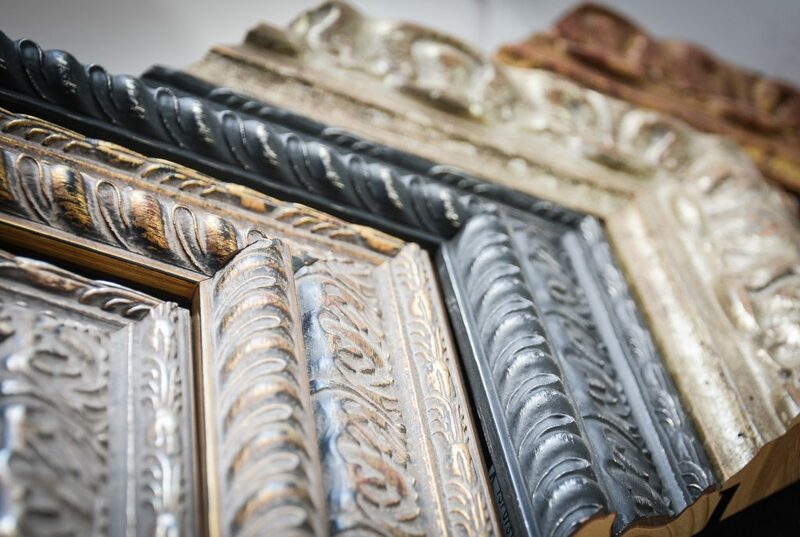 You’ll want to choose a frame that’s sensitive to the period it was painted and compliments the look and feel of your painting. Just because the original frame is damaged or looking tired and worn, doesn’t mean you need to replace it. You can restore most period frames made out of timber and plaster. Having a trained restorer carefully clean, stabilise and re-varnish or re-gilt it can bring back its visual attraction and substantially improve its lifespan. Missing pieces of plaster can also be remoulded and replaced. There are conditions that can be damaging to a painting if it is kept in them. Excessive exposure to UV rays and humidity can be very damaging to paintings. UV light can cause canvases to become brittle, and cracks in the painting. Excessive exposure to humidity can cause your painting to buckle and its support to fail. It’s important to hang your painting in a location hidden from these conditions wherever possible. If there’s no way of avoiding having your painting exposed to excessive amounts of UV rays or humidity, it is possible to create an artificial environment within a frame to keep it in. Paintings that travel all over the world for various exhibitions are sometimes framed like this to protect them from changes in climate. There are 4 main types of glazing that we use. Standard glass, non-reflective, ultraview (the museum quality glass that makes your picture look like it has no glass), and perspex. Which you choose will depend on 4 things: budget, the size of your painting, whether it needs transporting and your preference. Ultraview is a lot more expensive than standard glass, but if you have a very large picture, standard glass may make it too heavy to hang. In this case you may be better choosing a glazing that is lighter. Also if you’d like to ship your picture overseas, it is better to choose perspex, as it will be less susceptible to damage whilst travelling. When it comes to framing the more unusual items, such as football shirts, badges and medals, you can be quite creative with the way you frame them. Box framing can deliver an exceptional result. Depending on taste, you can float what you’re framing on top of a mount, or mount them in cut out windows. There are three ways you’ll be able to tell that you’ve chosen the right frame for your picture. When you see it framed, your eye should first be drawn the to the picture. After this, you’ll look at the frame and admire it as a whole. The frame and picture will compliment each other. However, while framing your picture is beneficial, it may not always be right to do so. In some cases, the painting can look better just hung as it is without a frame. So don’t fear in the right circumstances to opt out of having it framed. Now you know how to choose the right picture frame, why not take a look at our shop to find the perfect frame for your painting.